Behind the storefront of Yarns at the Adobe is a hidden oasis where knitters convene. A patio tucked away at the end of a narrow hallway is the spot that a tight-knit group of women comes together to knit for a cause. 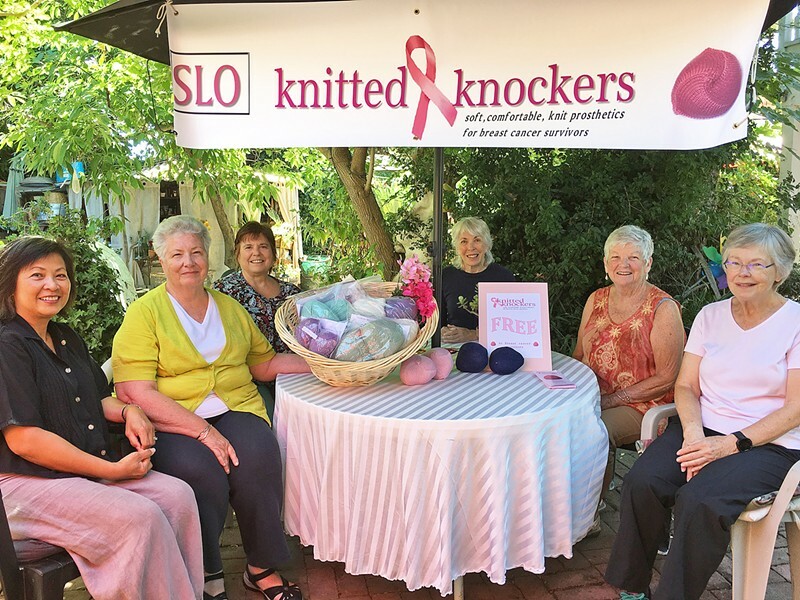 Once a month, the SLO Knitted Knockers meets to make prosthetics for breast cancer survivors. GIVING Local women come together once a month to knit a pair of knockers that bring comfort and a little happiness to breast cancer survivors. Judy Lang, a member of the chapter, said she and a few other women went to a knitting convention in Santa Clara where they came across a booth for the national Knitted Knockers organization. She said the story they heard moved them to start their own chapter. That tale begins when Knitted Knockers founder Barbara Demorest was diagnosed with breast cancer in 2011. Aside from dealing with her health issues, Demorest was worried about getting back to her routine, her normal life. Lang said Demorest wanted to go back to work while maintaining her appearance and keeping her medical procedures private. "It was emotionally difficult for her, and she thought right away that she wanted to get fitted for a prosthesis," Lang said. Reconstructive surgery wasn't an option for Demorest and the wait period for prosthetic breasts would be several weeks. Demorest was at a loss for what to do, but after a doctor visit she learned about a knitted alternative. With a pattern in hand she asked a close friend, a knitter extraordinaire, to knit her a pair of knockers. "Her friend gave her [Demorest] the pair at a gathering, and at that moment, she went into the bathroom and slipped them in," Lang said. That's when Demorest decided that she wanted to make this alternative available for all women. Knitted Knockers is a national organization that even sends knockers internationally. SLO's chapter of the organization made contact with oncologists around the Central Coast so local women can get in touch with them to receive a pair. The chapter has added its name to the national organization's online registry so it can send knockers to women in need all over the word. Local chapter member Diane Denman said this particular group of knitters has gotten together for a couple of years now and has chosen different causes to knit for. "We've done different things before as a knitting group. We've made hats, scarves and dolls. But this is important because it's women helping women," Denman said. Once a month, the group purchases yarn of various colors from Yarns at the Adobe and takes their spot on the p atio in an area shaded by trees. Knitting brought these women together, but the act of giving women what they need is what keeps them coming back every month. "It's great to give a pair of these [knockers] to a woman that really needs it and see how much comfort it brings them," Lang said. Lang shared that some women are so happy with their pair of knitted knockers that sometimes they see how they fit the minute they get them. "It's usually the older women that aren't worried about trying them on in private," Denman joked. The local chapter wants to make clear that the prostheses are completely free and made for women of all shapes and sizes. They are made of cotton yarn and left open so each individual can adjust the stuffing inside of it. If you're a knitter interested in helping, knittedknockers.org has a pattern you can follow and knocker kits available. Women who would like to contact the local SLO Knitted Knockers can email sloknittedknockers@gmail.com. Staff writer Karen Garcia wrote this week's Strokes and Plugs. Send tips to strokesandplugs@newtimesslo.com.